Difference between revisions of "Jyarimon"
Jyarimon is a student at Togemon's preschool. Another Jyarimon is seen at the Fortune Teller Village. Several Jyarimon were at both Villages of Beginnings. 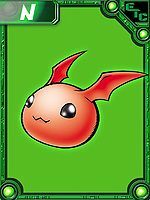 An extremely scarce Digimon, whose population is small. The Babies of Dragon-species Digimon are small in absolute number, and it is said that most of them are captured or die before they grow up. You wouldn't know it to look at it, but there are tiny, closely packed fangs growing within its mouth, and it is foreseen that it will grow into a powerful Dragon-species Digimon. Although it is powerless, it has the disposition to face those with bodies larger than its own, and that becomes the reason for its low survival rate. It attacks with bubbles heated by the constant high temperatures within its body. Means "pebble" and is also a very colloquial expression for a young child. Nekki wo Obita Awa  Fiery-heated Bubbles 熱気をおびた泡 N/A Spits bubbles heated by its high body temperature. 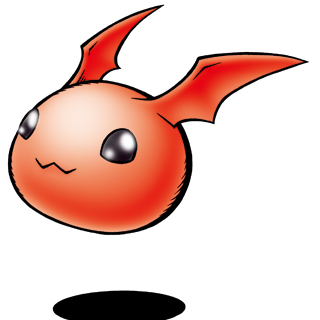 Jyarimon is an obtainable Digimon which is hatched from the red DigiTama, and evolves into Gigimon. It can also be obtained as a collectible card. Its card is part of the Cute Children (かわいい子供たち Kawaī Kodomotachi) set.